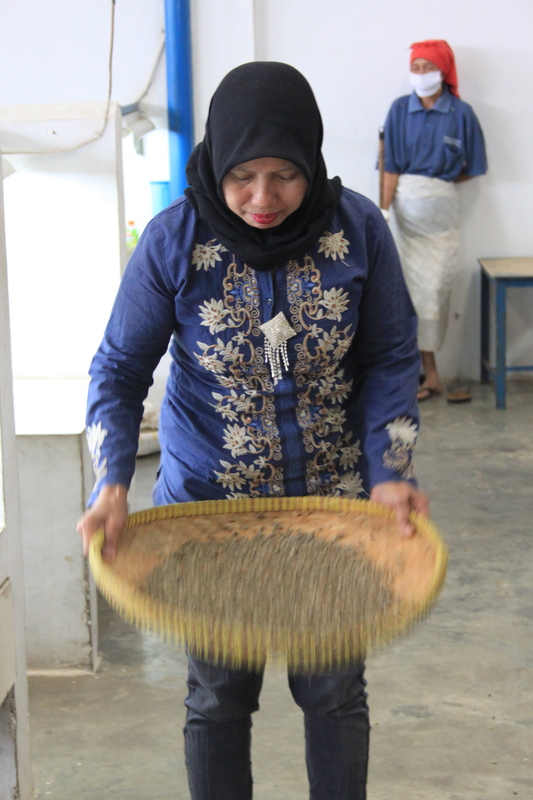 The last day at Wahana started with a guided tour of the fields, having a closer look at the Andong Sari which is now in its 2nd year of producing. It’s a Javanese hybrid that have good yields there, but so far it looks like it bears a bit less fruit in the Sidikalang soil. 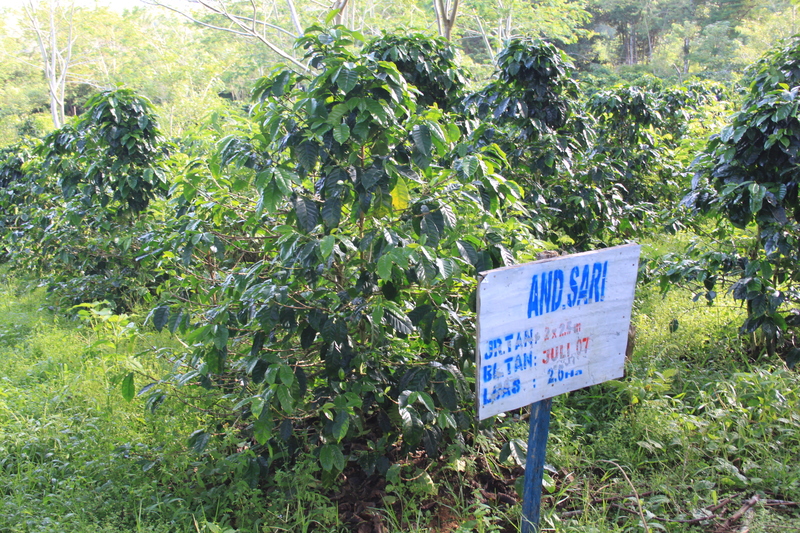 It’s the only plot of Andong Sari in Sumatra so I’m curious to see if it’ll be on the cupping table tomorrow. 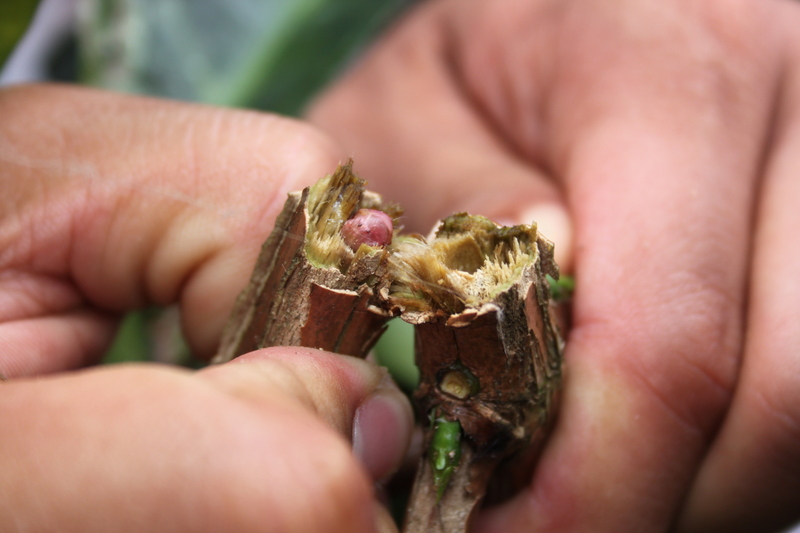 They also took us to the 600 Costa Rican Caturra trees, who have yet to produce a significant crop after 4 years. I was quite excited to see 1250 Villa Sarchi trees as well, but these are also slow to produce, 4 years in and only a few cherries so far. If it cups well when it does mature, they will expand the lot, and they might prune the trees a bit next year as they’re looking a bit busy at the moment. The cherries I tasted were really sweet and quite fruity, so I’m excited to keep an eye on this one. 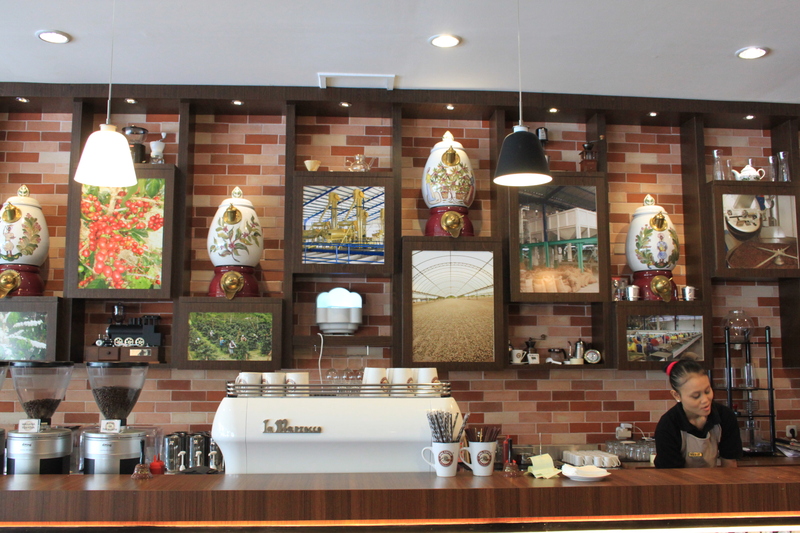 All the different varietals here came from the Jember Research Centre in Java where the three Wahana agronomists have also received training. 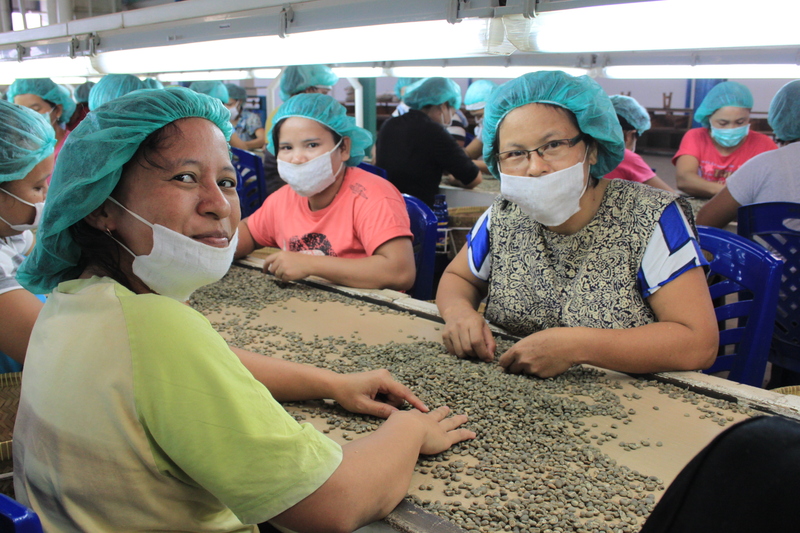 They’ve also been able to travel to Vietnam to learn about their coffee, and I hope at some point they’ll also be able to travel to Central America to see processing there. Education is high on the priority list at Wahana, they are in fact building a coffee school there this year where growers can come to learn about shade trees, nurseries, planting, pruning, cupping etc. The building will hold bedrooms and kitchens for those who will travel from afar, a cupping lab and a lecture hall, and be within walking distance of the mill as well as the different varietal plots. It will be free for the farmers to attend and they will be bussed in from local ares first, then they will look into inviting farmers from further afield. The government have promised to assist in spreading the offer as far as possible, and Wahana hope to be able to teach 3 day courses for 50 people at least once per week. The training modules will be taught by the agronomists on site, and a couple of international companies are assisting in developing comprehensive contents. All this will of course cost money to build and run, and they’re welcoming any donation towards the $220.000 building at first, and then funds to keep the program going. 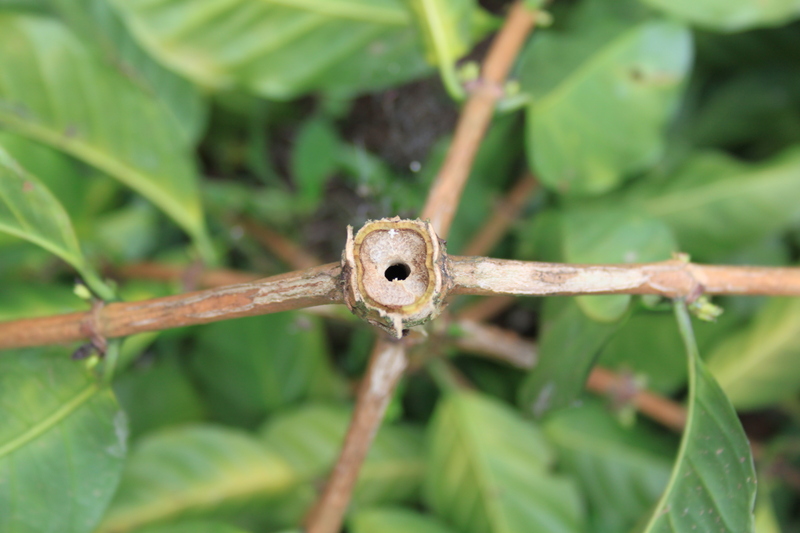 One of the urgent subject to cover is the importance of planting shade trees, as since illegal logging has taken out a lot of the natural shade forest raising the temperatures, the pesky coffee borer beetles have been spreading very fast. 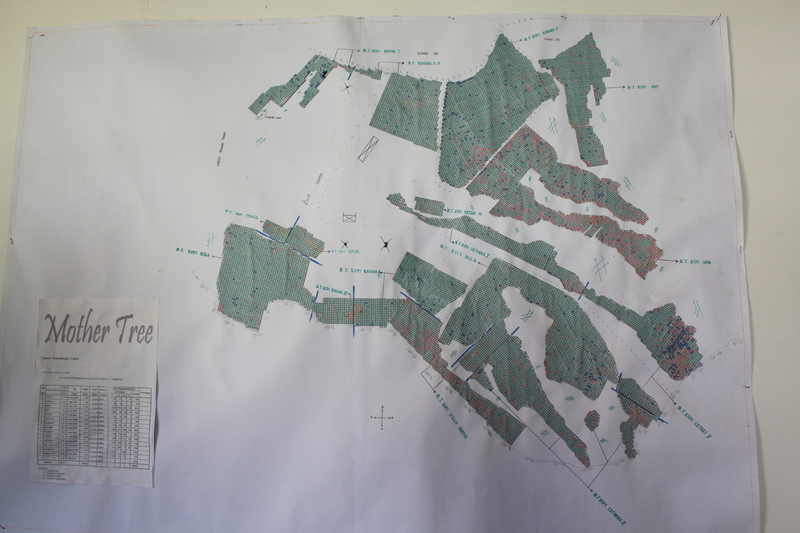 While some help has been offered to distribute methanol/ethanol traps for the beetles, the root of the problem needs to be fixed and for a few years the government have driven campaigns to make the areas around Lake Toba green again, replanting the trees that were logged with no consideration for the environmental impact. We head off to another farm where we later on get to see first hand another pest problem that Wahana hope to be able to find a solution for through their experiments and research. 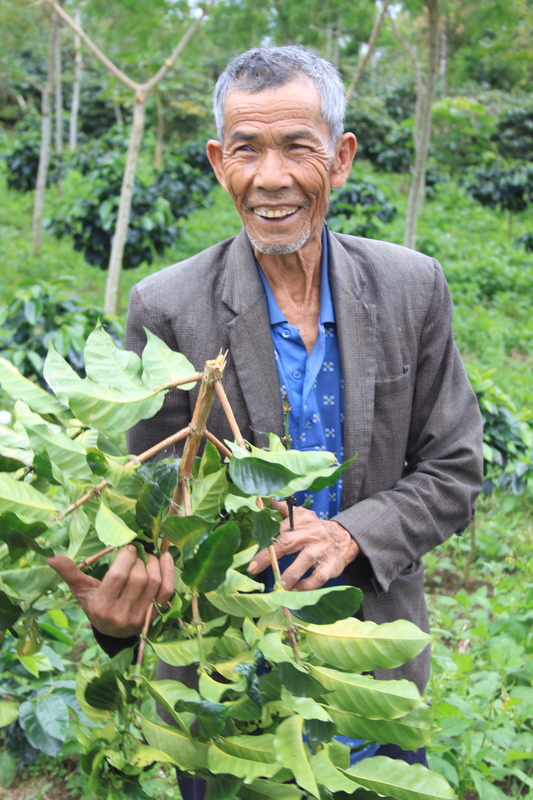 We meet with the farmer (he has 2 hectares himself) and collector Silalahi who gets cherry in from 7 groups of 30 farmers each, each of them with farms of about 10 hectares. 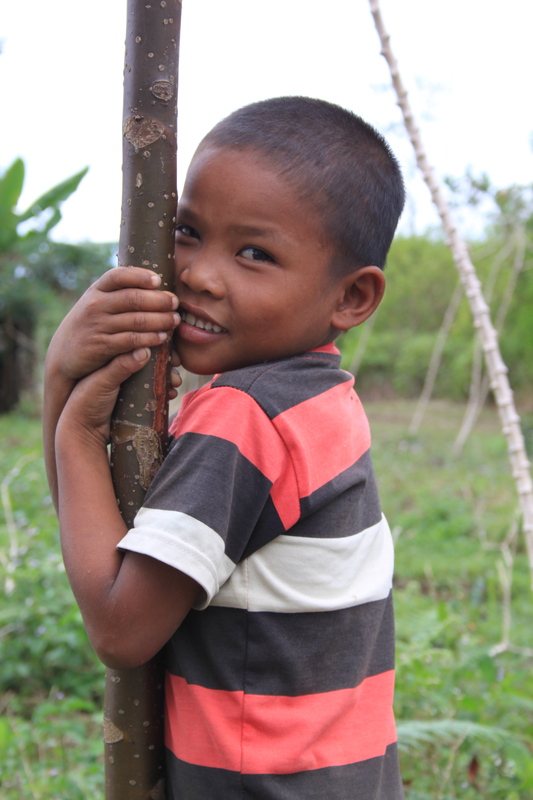 He took us to the farm of Mr. Symbolan, who was in fine spirit in spite of his trees being affected by red stem borer, a larvae that eats its way from the ground up through the trunk of the tree, causing the stems and branches to wilt and/or break easily, and increases susceptibility to other pest and diseases. Young trees may die while older trees tend to survive, and there is no known chemical or biological cure at this time. Incidents tend to be less where there is good shade, and until preventative measures can be taken or a defense is found, infected trees should be taken up and burned. 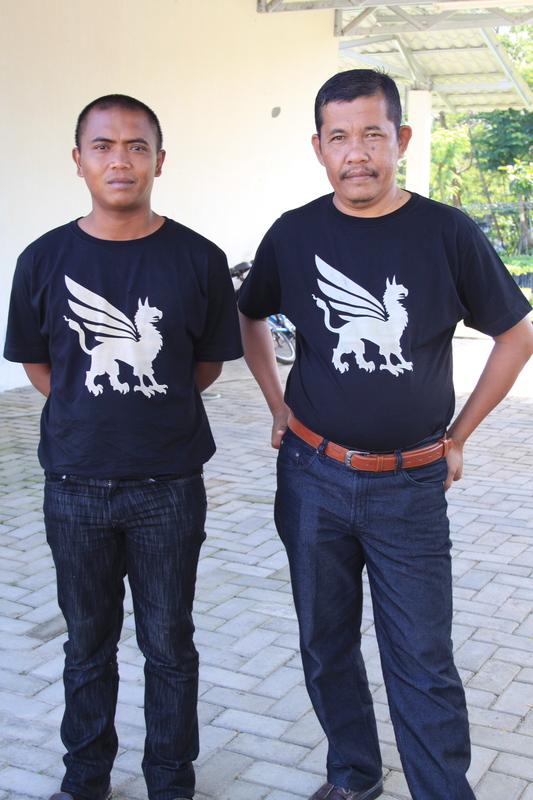 This was the last farm we got to visit so we headed north back to Medan and said goodbye to our very brave and skilled driver Johnson and his assistant Ronnie, who were super sweet and had both put on the tshirts I gave them earlier in the week! 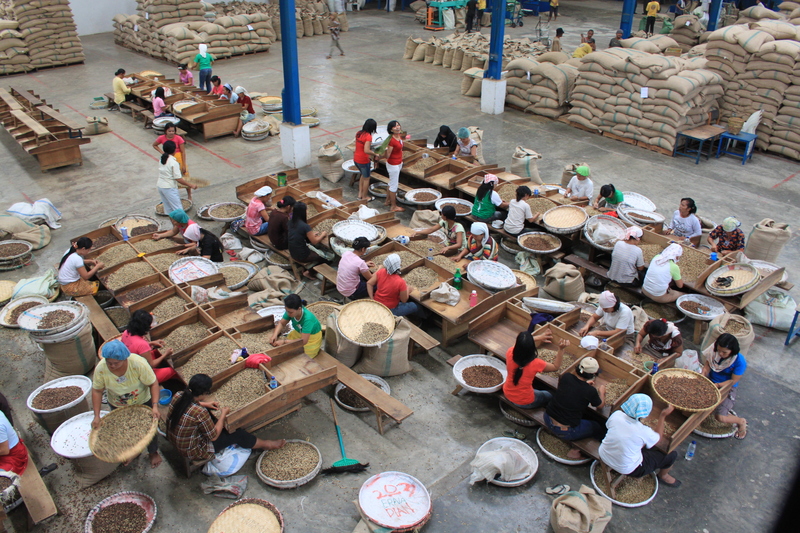 Tomorrow we visit the Sarimakmur dry mill and do some cupping which I can’t wait for. I’m really looking forward to tasting all the coffee I’ve been snapping pics of for the last few days, and have high hopes for some tasty beans! Last day doing coffee in Medan, tomorrow I return home. 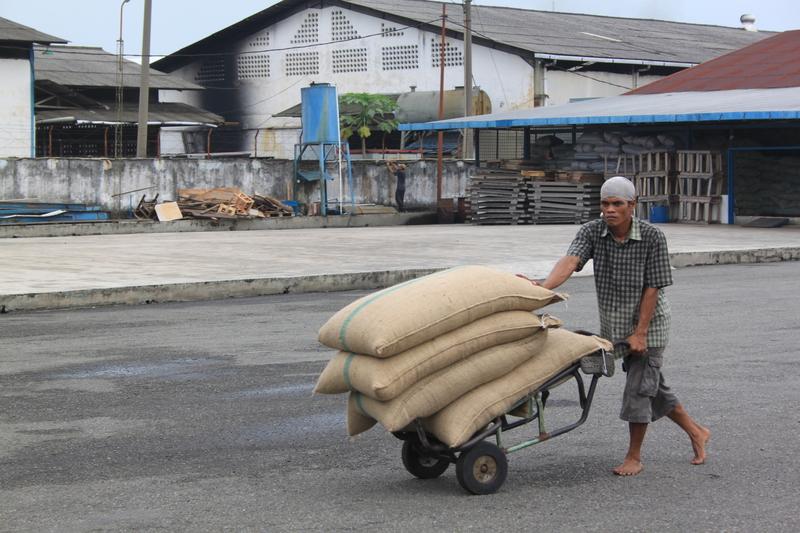 Today the trip went to Sarimakmurs mill in Medan, where their coffee is finished for export. We’re greeted by the owners Mr Suryo Pranoto, his wife Maria Gorethy and son and manager Andry, who poured us a cup of coffee, fed us Chinese New Years cookies (it’s not till Monday but Maria likes to start the cookies early) and explained more about the story of Sarimakmur. 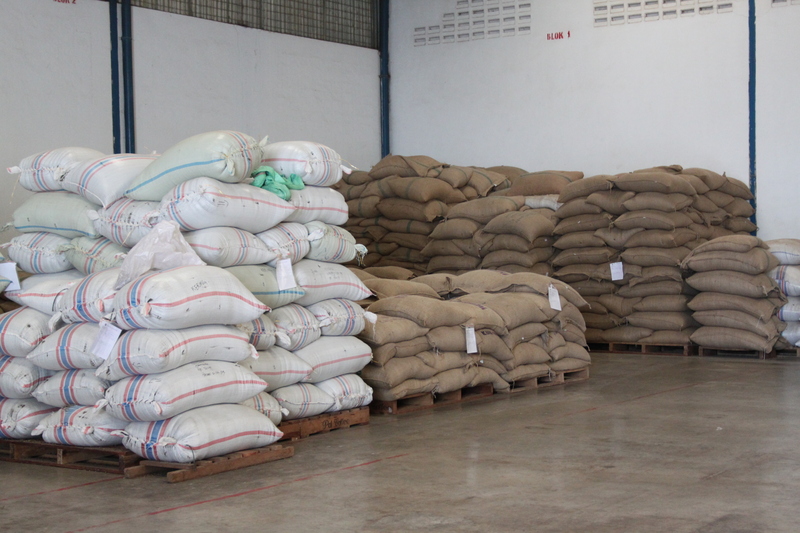 Having dealt in spices, cocoa and sweetpotato for many years, they only began trading in coffee in 1994, currently exporting 14.000 tons of coffee per year. They started roasting as Opal Coffee 15 years ago, also importing some coffee from other producing countries to diversify their blends. 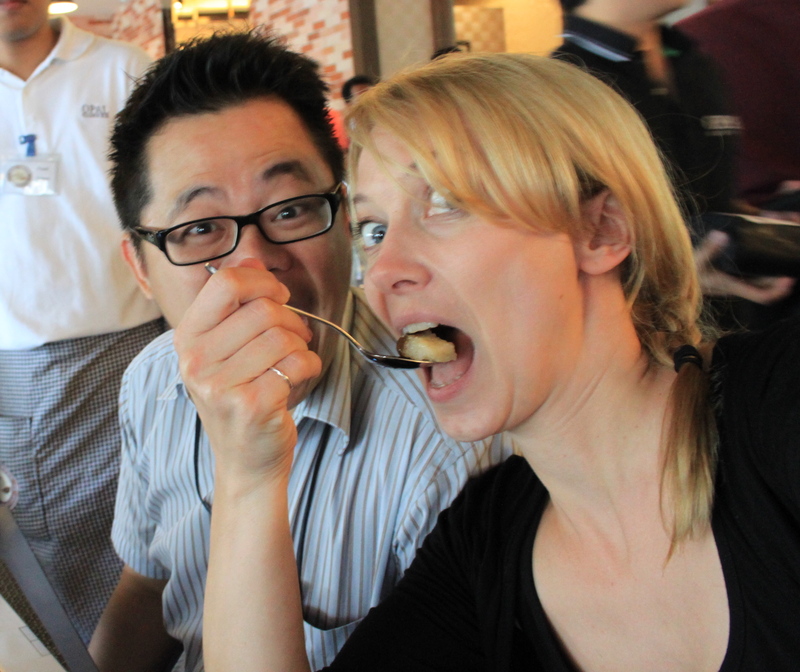 They opened a cafe in Sydney in 2010 and just three months ago they started the Opal Cafe in Medan, in the building that used to be the family home. 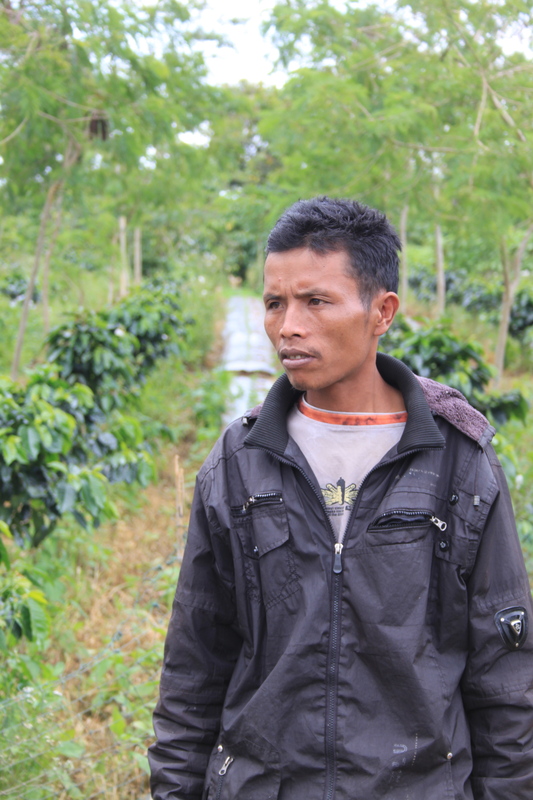 In the middle of all this came Wahana, after the local government contacted Suryo to see if he would be interested in taking on the land to produce coffee. 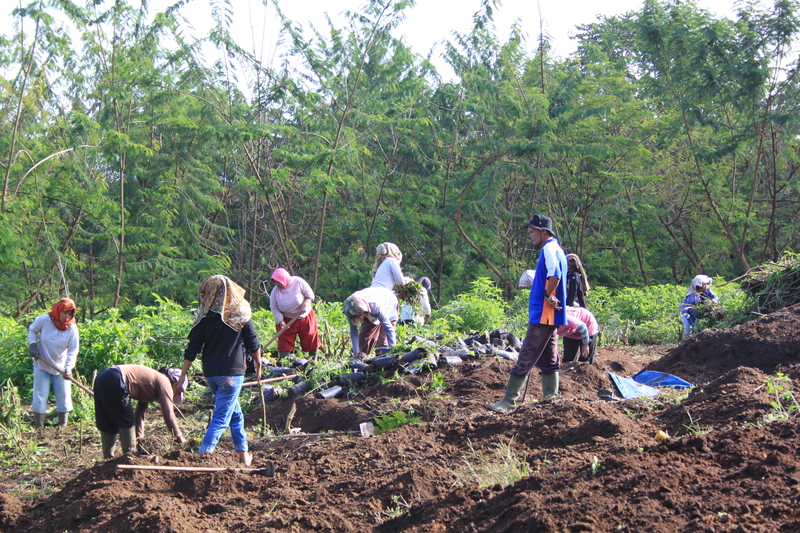 Other than a little bit of maize and cabbage there wasn’t much there, so they brought in agronomists from Jember to analyze the soil and climate to establish whether the area would be well suited for coffee. After positive reports they began clearing the land, leaving/planting shade trees where needed, and bringing in varietals to experiment with. The way they want to move growers away from delivering wet parchment to delivering cherry means that they have to spend a lot of time on the ground building relationships, and it limits them to focusing on one area at a time. 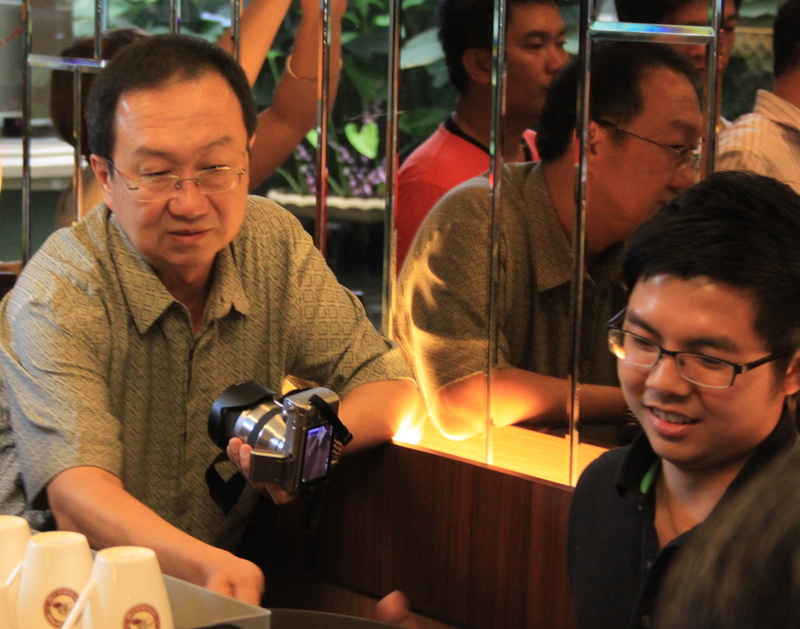 Expansions are however in the pipeline, they already have one facility in Sulawesi and are currently planning a wet mill for cherry in Toraja. 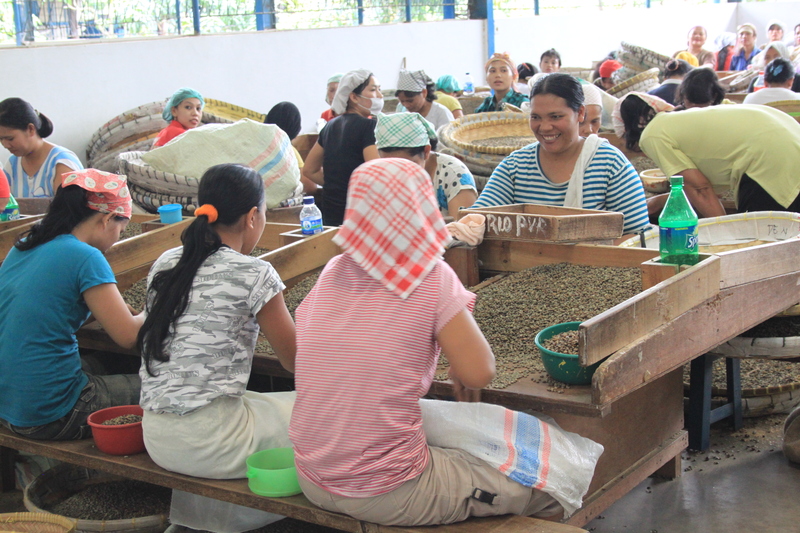 The quality of the Kalosi they saw last year as very disappointing and they wish to gain better control over the process there, as they have for example in Lintong and Sidikalang. 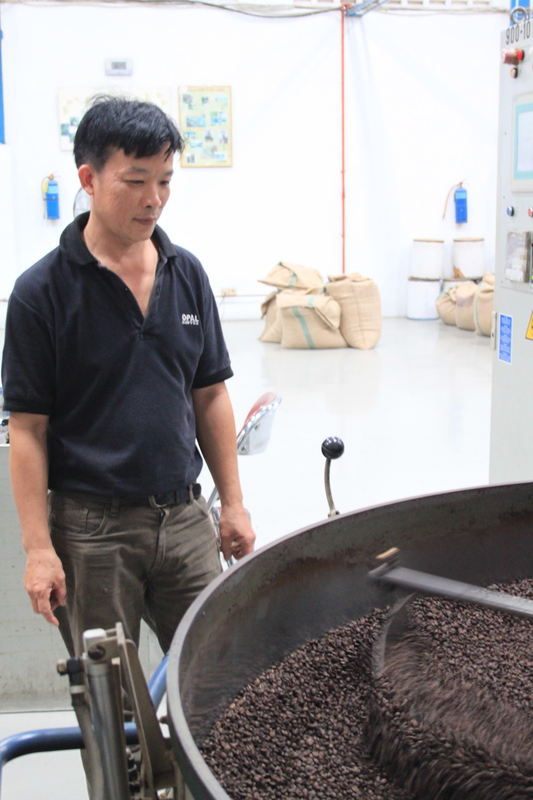 The problems arose from bad weather conditions causing a very low yield, meaning the growers would pick even green cherry and somehow ferment it in order to make it soft enough for them to pulp- devestating the quality in the cup. Hendry our guide will be spending 9 months there this year to oversee developments, and I’m really looking forward to seeing what they will create, as the ‘regular’ Kalosi from them was quite nice 3-4 years ago. East-Timor, Flores and maybe even China might be next, these guys certainly are ambitious but seem to genuinely care about quality and moving the industry to a better place. They currently have about 10.000 employees across all sectors, about 1000 of them located at the HQ where we’re visiting. 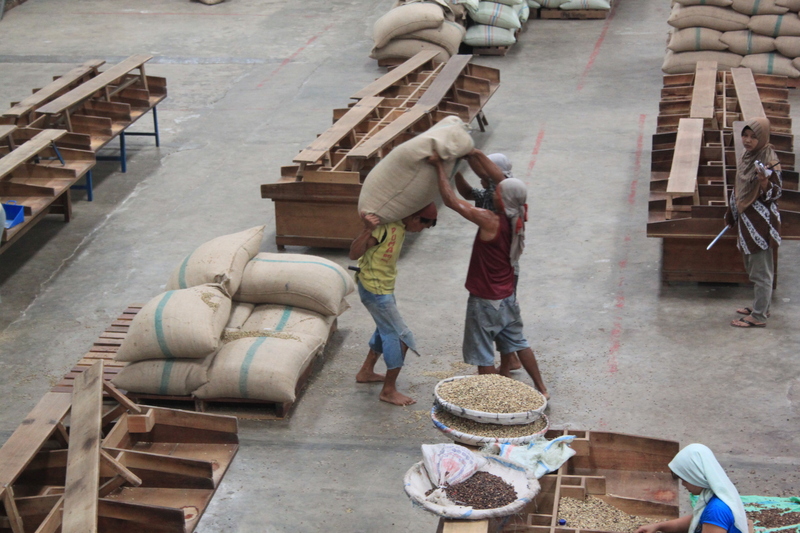 After a long chat and exchanging of presents we went for a tour of the coffee warehouses, which were busy and in full production mode meaning we were able to have a good look at all the various stages. 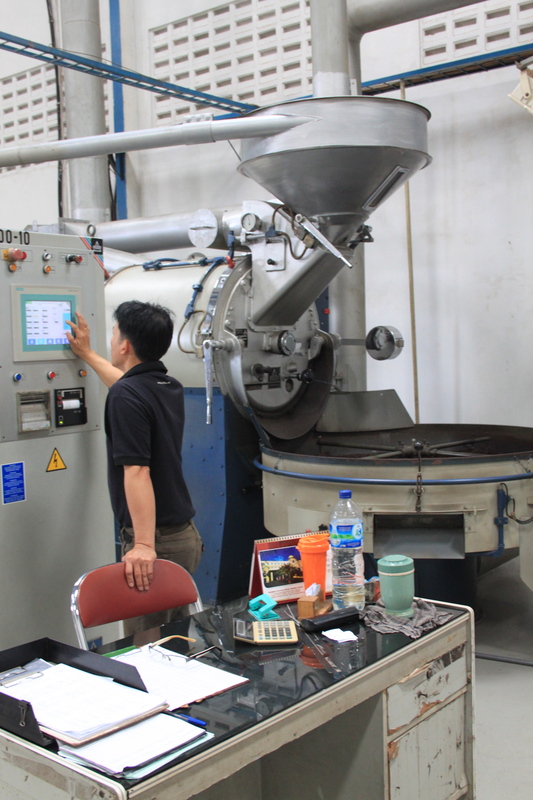 Except for the Wahana coffee, which is already density sorted in the Sidikalang mill, coffee starts off going through the density grader, continues on to the colour sorters (they can do 15 tons/hr) and through all the other various tubes and channels and sorters a dry mill contains. In a way many mills are all the same, but I really enjoyed the open, airy feel of this one, and the friendly vibe from the staff who were happy to chat and answer questions, and let me get very much in the way to take pictures. The ladies hand sorting had as much great fun watching and taking pictures of the pale, blonde visitor as I had taking pictures of them and trying my hand at sorting out the defects, the mood was really good and everyone was smiling and laughing, gossiping away over the tables. 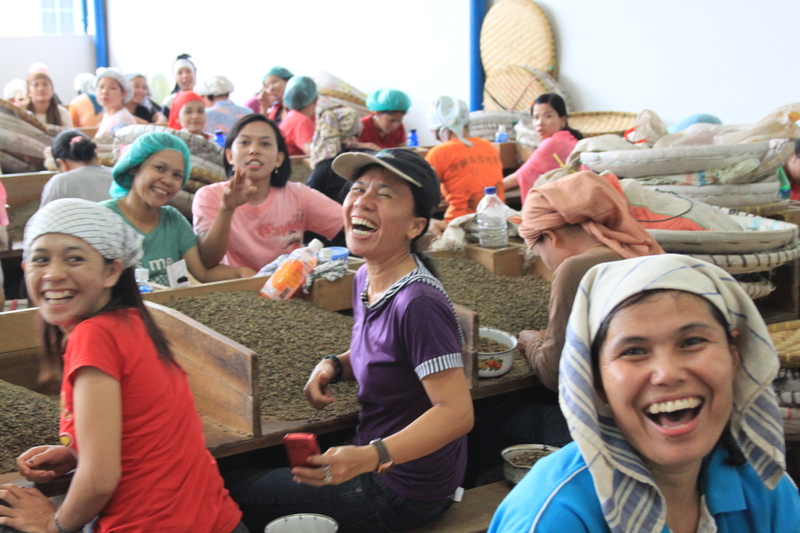 There were probably 6-700 women in that day by the conveyor belts and sorting tables, but in peak season there could be double that in a day over a couple of shifts. 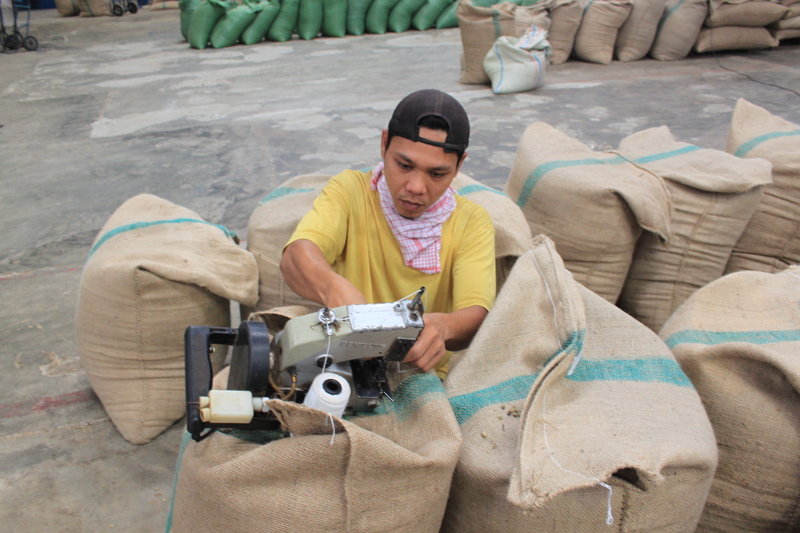 They get paid by the amount of defects they pick out of the green, 1 kg pays 500 rupiahs. 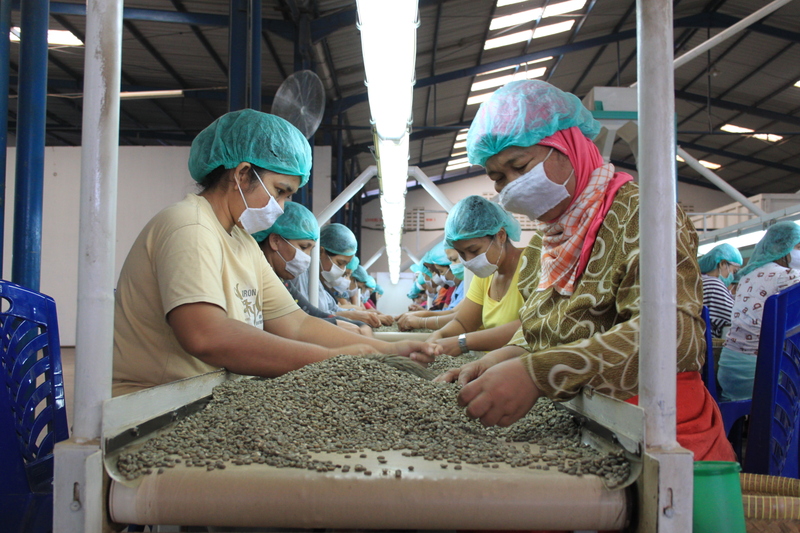 Andry told me they start out with the greens from the mechanical sorters which only cleans the coffee up to about 25-30% defect, then depending on the grade they’re selling; single, double or triple-pick out anything down to zero defect which would be the requirement for roasters like us. 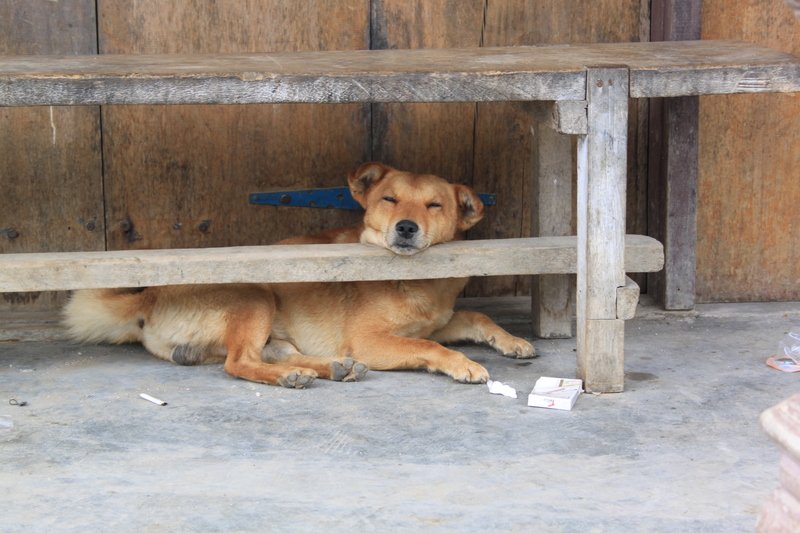 Normally they do about 10-15 kg each in a day, but they could also do to up to 60 kg on a good day, perhaps if the coffees come in particularly rough looking! Equipped with cupping sheets we set about evaluating the coffees, and I thought I’d summarize briefly here what I found. I picked up a few samples to take back with me and I’ll make sure I get the rest sent over and hopefully I can put on a cupping of them all in London too, when they’re a bit more rested and I have more time to go in depth on the flavours. Wahana Estate Washed: their ‘house blend’, super bright, crisp and clean, very nice ‘Indonesian’ character (which I think is important to preserve- all parts of the world shouldn’t taste the same! ), herbal, cooled a bit rough but more due to young greens, not at all bad greens. 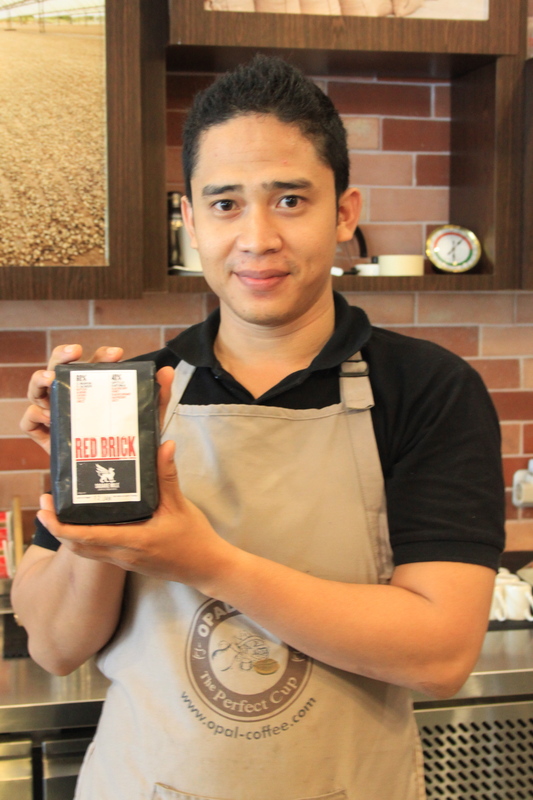 Wahana Estate Pulped: very pleasant texture, clean and sweet, fruity notes and long aftertaste, plums and cherries. Liked this a lot! Wahana Estate Natural: watermelon, fruity as naturals are, quite a light texture, some indo character left underneath, might need a bit more rest of just a bit more cleaning to really shine, but great potential. Rasuna: this was the one they’re rolling out all over Wahana so I hoped it would be good, and it was quite ok. A little uneven perhaps but some fruity characters, slightly savoury and nicely textured. Very decent coffee, but nothing wildly charming. Jantung: probably my least favourite on the table an very much what many people unfortunately dismiss a lot of Indonesian coffee with: woody, rough and dry, some spicy notes but little sweetness and a lack of acidity. I was told this was a tricky one to roast and perhaps it could perform better under lighter circumstances, but I don’t feel the roast was noticeably too dark so my issues were with the bean itself. Andong Sari: ah the Andong Sari, the coffee I bought last year from its first harvest and couldn’t work out how to roast to be a coffee I’d want to sell. Annoyingly, or thankfully, I really enjoyed this 2nd harvest sample, it was round and clean and had some soft stonefruit, spice and chocolate to it. 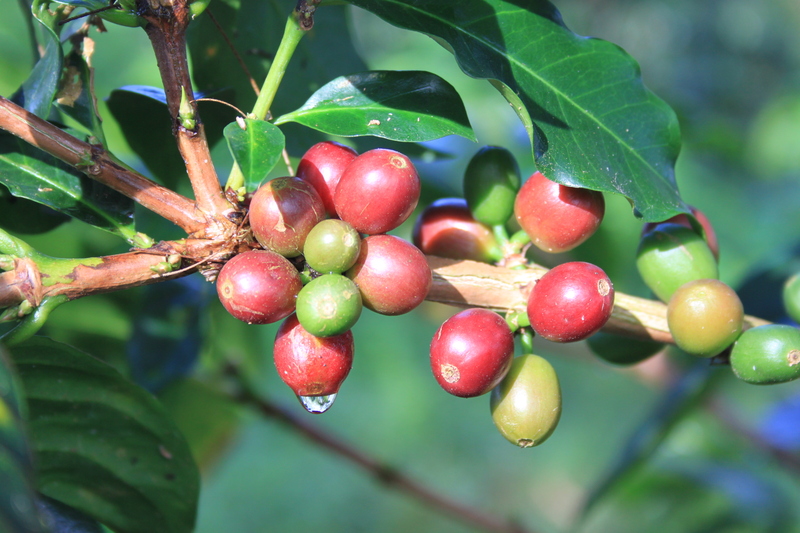 USDA: supposedly this is an Ethiopian line brought in by some Americans in the 50’s, but I found it to have little in common with Ethiopian coffee, perhaps a bit Harar-y if anything. A bit grainy, dry, with some tobacco and whisky, it was woody and while not directly unpleasant one of the only two on the table that I outright disliked. Costa Rica: I quite like this cup, some confusion over the samples means I don’t know which of the Costa Rican varietals it was but I found it to be clean, crisp and a bit floral, very nice indeed. Longberry: It didn’t blow my skirt up but everyone here raves about it, and I guess I can see that the boozy fruit and lush texture would be pleasing to many. I’d want to try this again in a couple of months on a slightly lighter roast perhaps, it just felt a bit closed off but I think it could grow on me. 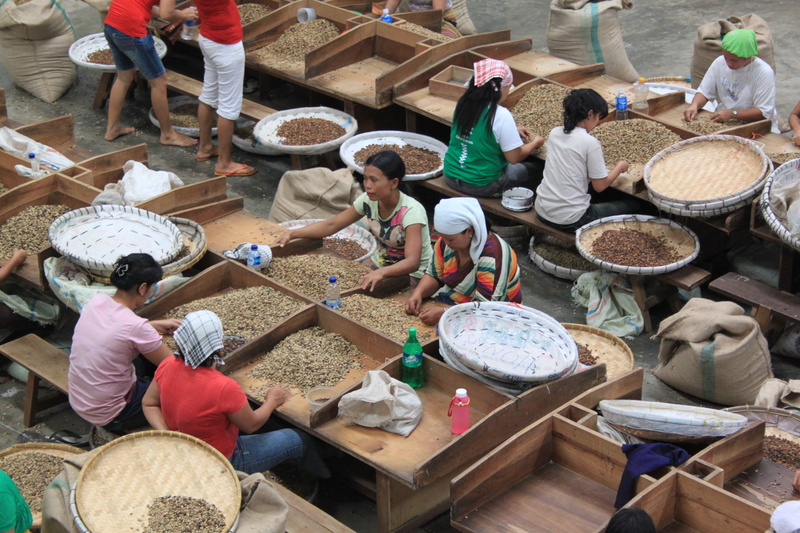 Toraja: This felt like the standard Indonesian coffee I’d expect, just cleaner! A bit generic perhaps but very inoffensive, full bodied and a bit spicy. Just ok. 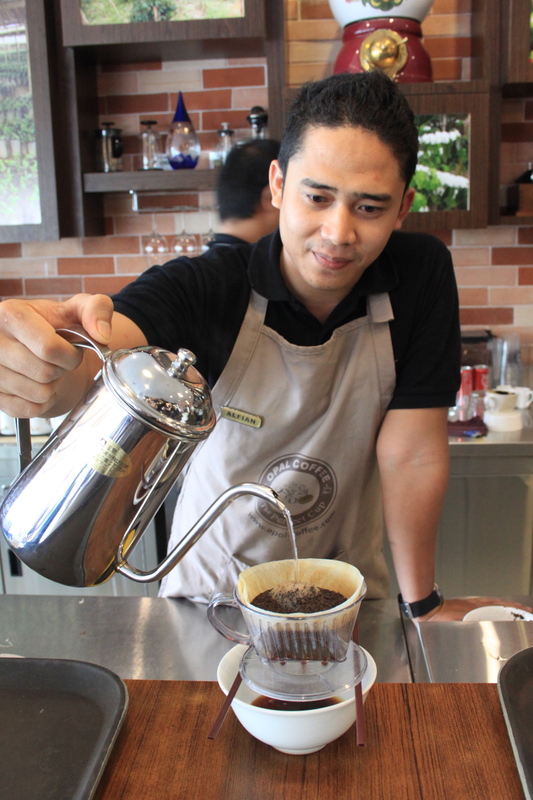 So in conclusion, I was really pleased to find a lot of the coffees to be much better than most things I’ve had from Indonesia, and to be very varied as I’d hope and expect. 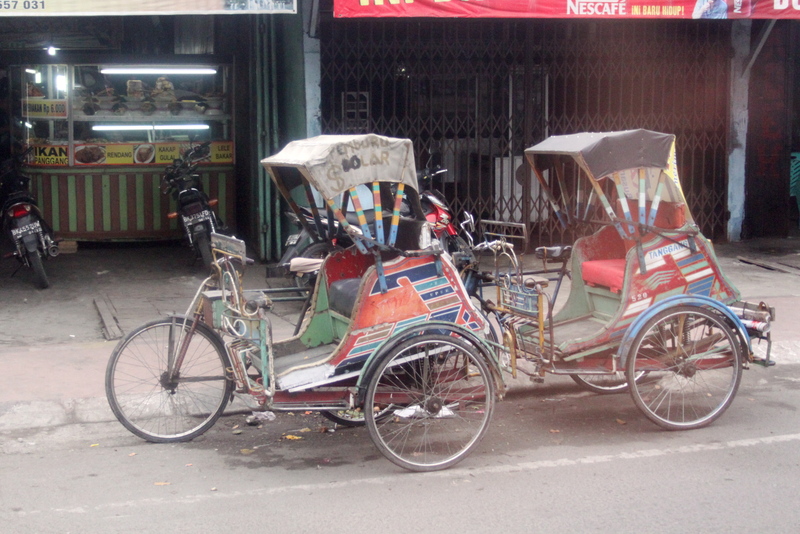 Will I try to buy any of these, like the Andong Sari, again? I’d love to but I don’t know. I would perhaps wait till grainpro or vacpacks become available as shipping options, as I think with Indo coffees, which I generally find to drop off very early after harvest, it’d give me the added confidence that nothing gets tainted or ruined in transit and storage or changed by too rapid water movements in the green. I’d also love to not have coffees machine dried, but weather and facility conditions here might not be suited for a lot of raised bed and patio. 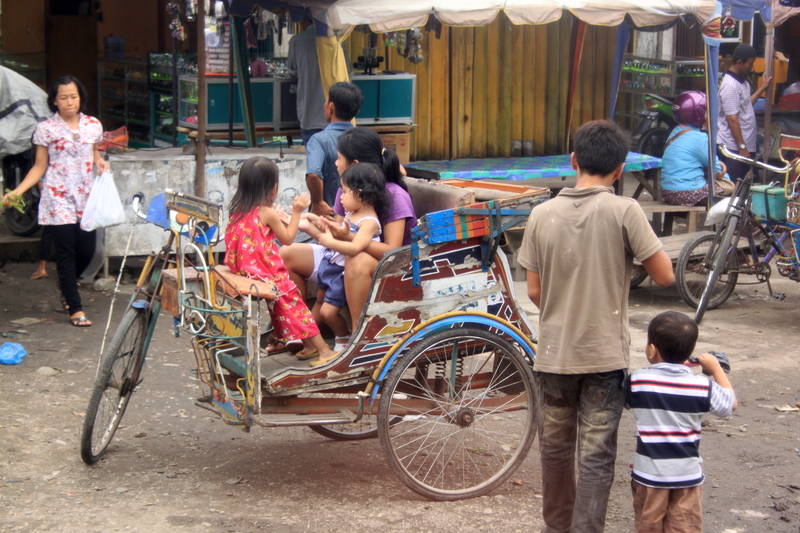 I hear Aceh has some raised beds tho, which is interesting. 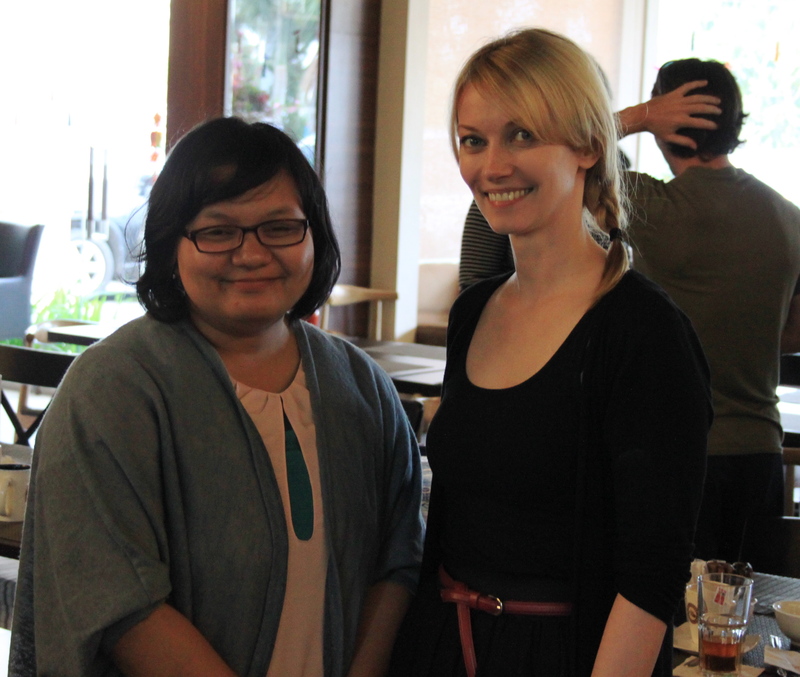 I also had the pleasure of chatting to Resi from the Indonesian Specialty Coffee Association, a young group that are working to raise awareness and the profile of Indonesian coffee both to their internal market and internationally. 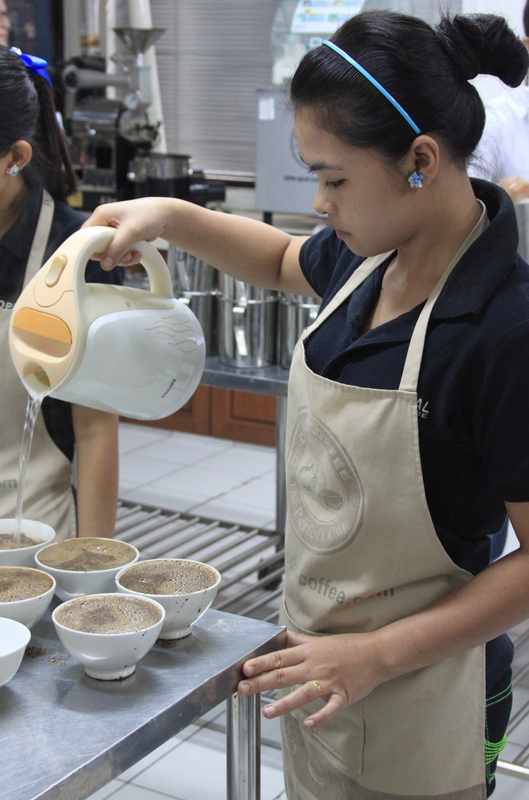 Having exhibited at the SCAA show for the last 5 years they will this year do their first show in Vienna, so I look forward to seeing her again there and to hopefully share with her any Sumatran or other Indonesian coffee I may have bought by then! 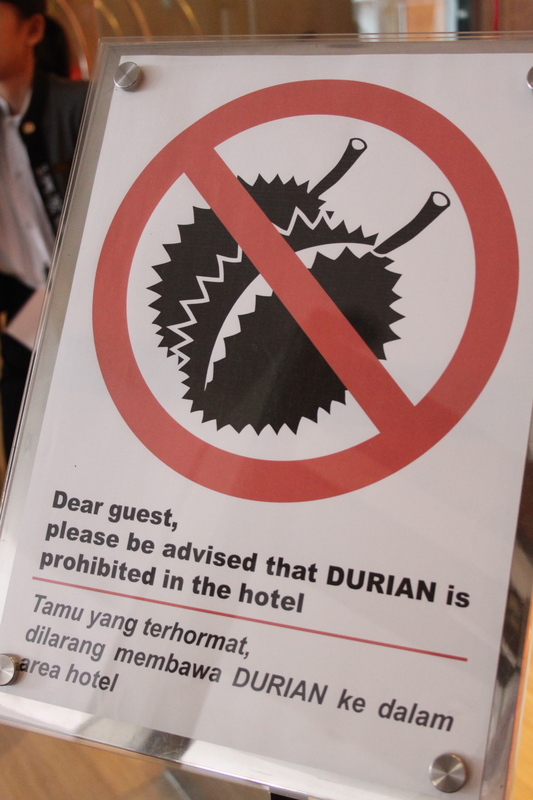 So now I’m headed home full of impressions and a few fewer questions, and a greater understanding of the challenges and opportunities for Indonesian coffee. Terima kashi to Hendry and Finn especially, growers, millers, hosts, fellow travellers, guides, drivers and animals big and small- it’s been a trip!